Have you ever seen this workflow? Someone shares a spreadsheet with a team, and several people add their contributions to it. The spreadsheet becomes the place where it's easy to manage, but eventually that data is meant to be used to manage data elsewhere, and later somebody inputs, copies, or imports the spreadsheet to some other format for presentation on the web. At several of the e-commerce companies where I've worked, using a spreadsheet was just part of the typical workflow. For example, buyers would maintain a list of vendors and products in a spreadsheet. Often this was because they didn't have all the data yet to make the products available - somebody had to decide the best marketing description, a manager needed to make sure the profit margins were correct for pricing, etc. After all that internal process was completed, we'd import that product spreadsheet into our e-commerce software's database when we'd want to make the product available online. In a couple of extreme cases, we actually would send the spreadsheet off to an offshore firm that specializes in manual data entry into platforms like Magento. After the data was inputed into the shop, we'd have to recheck it once more for accuracy before publishing! Phew! At Ongo Works we maintain a Google Docs Spreadsheet that is a list of features and related information like "status" and "Github Issue" for the Reaction Commerce project. I started looking for a simple CMS for our project features list for Reaction Commerce, when I thought - why not just use the spreadsheet itself as our CMS for our site? Turns out with Meteor and the Google Spreadsheet API this is pretty simple to do. First you need to publish your spreadsheet, and get the "spreadsheet key." 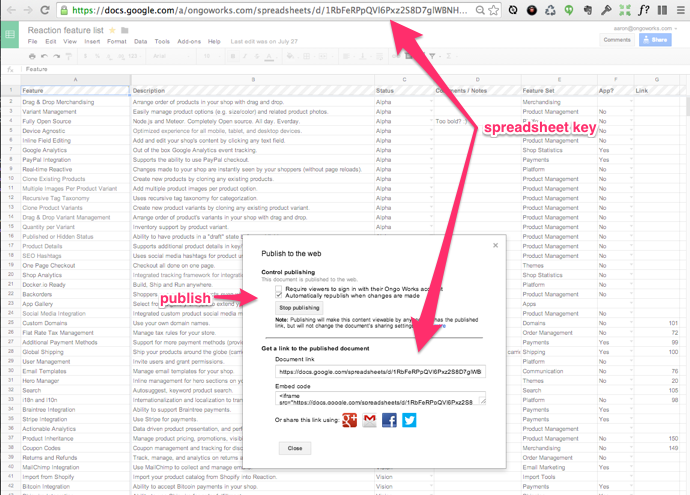 In your spreadsheet goto File -> Publish to Web, start publishing and grab the spreadsheet key from the spreadsheet url. I fetched this with Meteor.http.get and created a template helper, and looped through the results to format into an object that my template uses. This works pretty well, but there's usually a second or so delay before the results are rendered. To take care of this, I decided to fetch with a server side method Meteor.call('spreadsheet/fetch',"<spreadsheet key>") and insert the results into a collection GASpreadsheet and publish this to the client. This will first render the collection (cached copy), but will also update with the latest from the spreadsheet whenever a user views this page. Cell data is accessed with spreadsheet.cells.row[<column>].value when using this method and collection. In this package, the spreadsheet is fetched using the NPM package node-google-spreadsheets, wrapped, and inserted into the collection GASpreadsheet. I'm going to continue to add functionality to the package, two way syncing, editing the spreadsheet data in Meteor, etc., as time permits. So, now I have a CMS with team administration and revision control. I could easily add a field "visible," and filter the results by properties before displaying in the template view. Easy and fun. Hope you enjoy it. Aaron is the CTO/Founder of Reaction. He's an entrepreneur, creator and developer with over 20 years experience building some of the fastest growing consumer marketplaces and communities on the web.